This page is specifically for caregivers and friends who want to help. The biggest assistance is to ease the every day burdens of your friend or family member diagnosed with breast cancer. First, your help may be needed in providing emotional support after diagnosis. Hearing a diagnosis of anything other than ‘normal’ is unsettling and just plain scary as life will change in some fashion. Be there to be a good listener, a shoulder to cry on and let your loved one know you are there to help them however they need it. Second, you can assist with gathering information to help the patient make the right choices on the type of surgery and post surgery plan. There is a lot of information to sift through, surgeons to select, hospital to pick etc. Be supportive and help ask questions. Go along with the patient to be another set of ears to hear what the medical professionals are saying. Third, caregivers should prepare to assist the patient post surgery or through chemotherapy or radiation treatments. If a mastectomy is in the near future, read through my “Top 10 Tips Pre-Mastectormy” and “Top 10 Tips Post Mastectomy” section on this blog to get helpful information that can ease the road ahead. (After reading through these tips months after my surgery, they are not just for a mastectomy, but apply to any major medical procedure). The patient needs to rest to heal after surgery and also will have a 10-pound weight restriction for up to a month. Things around the house WILL be different for a few weeks. Chores like vacuuming the house, preparing meals and running errands call for assistance. Fourth, figure out a way to communicate with your loved ones circle of friends and your friends who want to keep up with the latest news and how they can help. Sites like CaringBridge.org are wonderful and allow updates about medical treatment and personal feelings of the breast cancer patient as well as supportive emails from friends and family. Setting up an email list might be another way to keep folks informed. A ringing phone can be annoying and telling “the news of the day” over and over can get exhausting for your patient and YOU. If the breast cancer patient is lucky enough to have a proactive caregiver to manage their life, that is the best scenario. If not, take it upon yourself to ask specific questions to help identify areas where they can use assistance. Instead of saying, “let me know if there is anything I can do,” try this, “What specifically may I do to help you?” If your friend/loved one doesn’t know, push a bit harder. “Can I take Johnny or Suzie to school or make you a meal?” “Do you need a ride to the doctor or someone to just sit with you?” That gives your friend/loved one some choices. Just don’t offer anything you really don’t want to do as they may take you up on it! My wish for everyone is that you have a “Grammie” in your life to bring over a home cooked meal or stock the freezer. Grammie’s sidekick, Grampie, is great for transportation and moral support and a great distraction from pain. Heidi is one of the best huggers I know and Sue is always up for a cup of coffee and conversation. And then there is Maureen. Her loyalty and ability to sense when I need something is uncanny. Girlfriends who can pick you up for a short outing and to help you feel ‘normal’ even for an hour or bring you to a doctor’s appointment are comforting and important in your healing, both mentally and physically. Finally there is my loving husband, Steven. He has been by my side the whole time and is my second set of ears, shoulder to cry or rest on and strength to help me endure. Call on your circle of friends and family, believe me, they are more than happy to help! 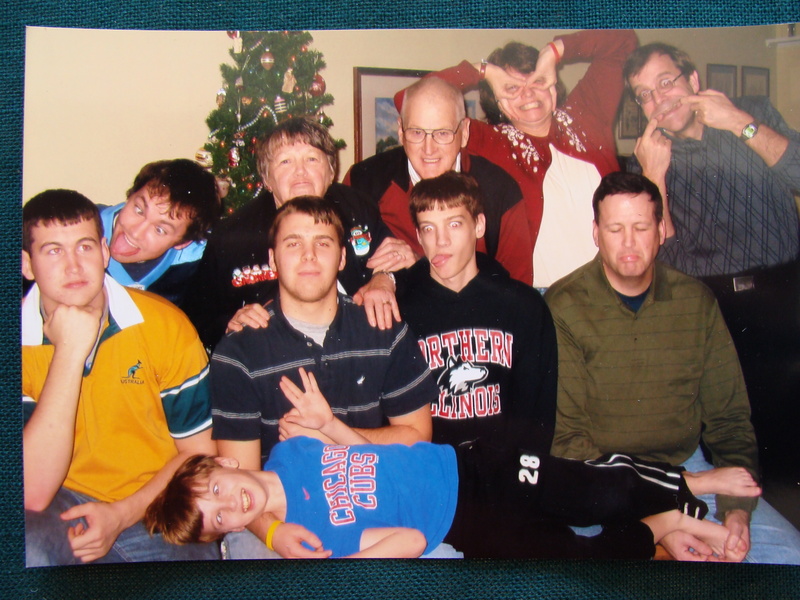 PHOTO NOTE: My husband’s side of the family live in the Chicagoland area – they all are very supportive and all I had to do was just ask…ok, so we look a bit looney, but we are close. Your eyes are right – no girls – I have two sons and three nephews, a brother-in-law, my husband and my father-in-law. “Grammie,” my mother-in-law, and I hold our own for the most part. There is one other female missing from the picture – Nancy Schmidt. We all miss Steve’s sister, Nancy, who lost her battle with lung cancer on October 12, 2007. Having gone through the rigors of being a caregiver for Nancy, I cannot stress enough the power of proactive support. This is your role. You are already off to a good start reading this page.